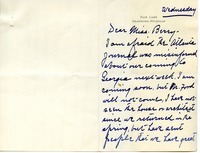 Clara Ford expresses her concern about the Atlanta Journal's misinformation on the Ford's coming to Berry next week. She promises to come soon, but she is presently concerned with building a new home. Mrs. Ford also plans to visit Mrs. Russell Hibbs, a friend of Mrs. John Hammond, in Pittsfield, MA before visiting Georgia. She wishes Miss Berry and the Campbell's to visit their (the Fords') new home.